A builder's transit level is a telescopic-like device used to determine differences in height for construction projects. A builder's transit level is also used for plumbing and utility installations where it is necessary to determine slope. The transit level is mounted to a tripod and lined up with marks on a Stadia rod, also known as a Philadelphia stick, that represent graduated measurements. A baseline reading is taken at the level itself, with subsequent readings taken at various distances. Basic mathematical calculations are then performed to determine the difference. A builder’s transit level is a used to determine height and slope. 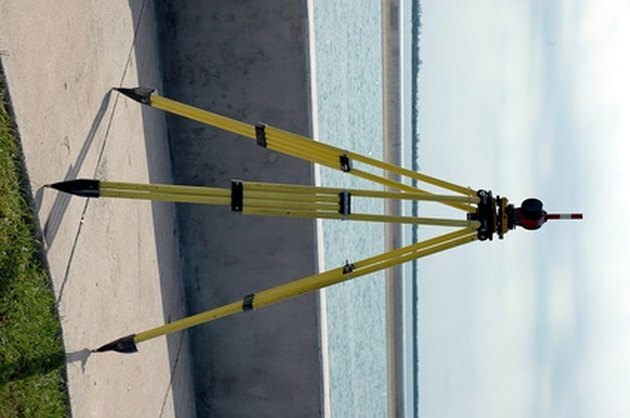 Extend each leg of the tripod until it set in a stable position. Attach the transit level to the tripod and adjust the tripod's legs until the bubbles on the top of the transit reads close to level. Extend the four thumbscrews at the base of the level. Rotate the telescope until it is precisely parallel with two of the four thumbscrews. Adjust the two thumbscrews until bubble lines up, noticing that the bubble will move in the direction the screw is turned. Rotate the telescope so it lines up with the other two thumbscrews and adjust until bubble lines up. The transit is now level. Take a reading (measurement) with the Stadia rod to determine the height of the level to use as a baseline reference. Instruct your partner to set the Stadia rod at the location you wish to measure. Look though the level and read the height of the mark on the Stadia rod that lines up with the horizontal line in the telescope. Subtract the smaller number from the larger to determine the difference in elevation points.